What would it be like to actually land on Pluto? This movie was made from more than 100 images taken by NASA's New Horizons spacecraft over six weeks of approach and close flyby in the summer of 2015. 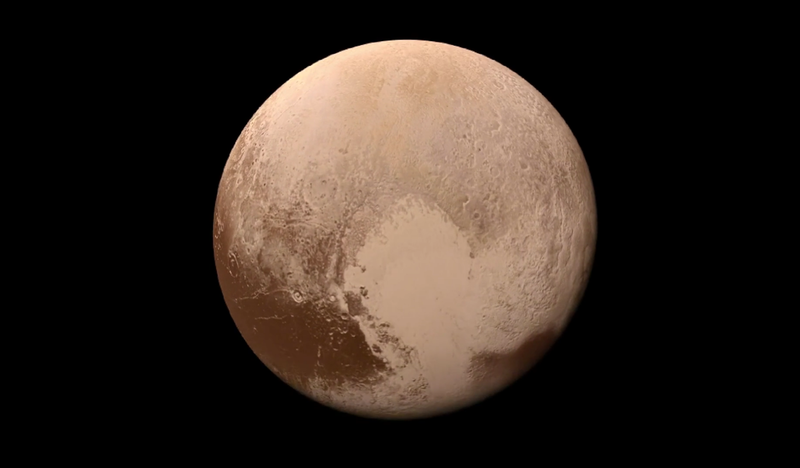 The video offers a trip down onto the surface of Pluto -- starting with a distant view of Pluto and its largest moon, Charon -- and leading up to an eventual ride in for a "landing" on the shoreline of Pluto's informally named Sputnik Planitia. To create a movie that makes viewers feel as if they’re diving into Pluto, mission scientists had to interpolate some of the panchromatic (black and white) frames based on what they know Pluto looks like to make it as smooth and seamless as possible. Low-resolution color from the Ralph color camera aboard New Horizons was then draped over the frames to give the best available, actual color simulation of what it would look like to descend from high altitude to Pluto's surface. After a 9.5-year voyage covering more than three billion miles, New Horizons flew through the Pluto system on July 14, 2015, coming within 7,800 miles (12,500 kilometers) of Pluto. Carrying powerful telescopic cameras that could spot features smaller than a football field, New Horizons sent back hundreds of images of Pluto and its moons that show how dynamic and fascinating their surfaces are. The original black-and-white "landing" movie can be viewed here.